It’s been over a month now since I went down to the Mac Store and traded in my beloved 15″ PowerBook for a 13.3″ MacBook. I had gone back and forth on whether to get a MacBook or MacBook Pro, eventually deciding to try out the MacBook and possibly upgrade to a Pro later on. For the most part, the things I don’t like and the things I like are what I expected. The biggest negative (and one which caught me offguard) is that it takes a long time to recharge the battery if you’re actively using the laptop — especially if it’s something intensive like charging your iPod. I picked up the laptop shortly before a trip across the country, and as I sat there in the airport with the battery charging much more slowly than I was used to, at first I thought there was something wrong. I don’t know if the issue is the lower power rating on the MacBook’s power supply (compared to the Pro charger), but it’s definitely something to watch for on long trips when you’re recharging in the middle of the airport. Apart from that, though, the negatives have been what I expected. I definitely miss the nice metal feel of the PowerBook, and I miss the larger screen. The MacBook has the same horizontal resolution as the PowerBook with a little less vertical resolution, but I knew I’d prefer the higher res of the 15″ MacBook Pro. The integrated graphics can’t play a modern game, but I was surprised to see in a quick trial that it seemed to play one of my old games just fine — and it was running in emulation under Rosetta! Granted it’s not much of a graphics challenge compared to a modern game, but it was much better than I was expecting. So far, that’s it, not much to complain about. One of the reasons I went with the MacBook was to try out the glossy screen. I’ve heard photographers go on and on about the matte versus the glossy screens, but so far I think the glossy screen is fantastic. I was afraid reflections would be a problem, but I haven’t found that to be the case. It doesn’t calibrate as well as I’d like with software calibration, there’s some shades of orange or red that come out too intense, but my PowerBook wasn’t perfect in that department either. What I really love about this screen is that you can use it outdoors, even on a bright sunny day. During the warmer months, I use my laptop outdoors more than I use it indoors, either riding the train to work or sitting out on the back porch. This was a real struggle with the PowerBook, but it’s a breeze with the screen on the MacBook — even with the screen not at full brightness. If the sun is shining on the screen (unavoidable sometimes on the train), you can still read the screen just fine, which I was certainly not expecting. At one point the entire screen was covered in sunlight, and I could actually turn the backlight all the way off and still use the screen. I can’t speak to how the modern matte screens of the MacBook Pros would do in a similar situation, but I’ve been amazed at how nice it is to use the little MacBook outdoors. Another pleasant surprise is the wireless reception. My PowerBook really struggled to get a signal on our porch, you had to sit in just the right spot with the laptop at the right height and angle to even get a slow connection. The MacBook gets a nice strong signal out here, and it’s almost comical riding the train to work and seeing how many hotspots I can see now. I’ve had problems in hotels before where the Powerbook could barely get a signal — at one hotel only the bathroom got even a weak signal, at another I had to sit in the corner by the bed. Sometimes you have to go into the hall or to the lobby, so the good reception of the MacBook is a welcome change. Oh my goodness, the speed. The PowerBook ran OS X just fine, but it really struggled to convert RAW images. I haven’t done exact timings but the MacBook is probably an order of magnitude faster. I haven’t seen this much of a speed jump in a couple of decades, it reminds me of my first PC when I upgraded from an Intel 8086 to a 386 and sat there with my jaw wide open at the difference in speed. I use Adobe’s Camera Raw converter for most of my images, and the funny thing is it converts images so quickly that it has completely thrown off my timing. With the PowerBook, I’d batch up a few images and then switch to reading email or browsing the web. With the MacBook, it’s done right away so I don’t have an excuse for goofing off on the internet. Based on the first versions of the MacBooks and MacBook Pros, I was worried about heat. My PowerBook already got hotter than I liked, especially during the summer months (we don’t have air conditioning), since I often use my laptop on my lap. So far, the MacBook seems to run a lot cooler than my PowerBook, at least in terms of the external temperature. We’ve had some really hot days this July so Apple, my thighs and I thank you. I like the latchless lid, it’s not significant enough to impact the buying decision but it is a nice touch. More important is how easy it is to swap out the hard drive, the 120GB drive is fine for now, but the same 120GB wasn’t going to be enough on the MacBook Pro since I’d want to install a Windows partition and some games — and swapping the hard drive there is complicated enough that I’d pay someone to do it. Another nice touch is the trackpad, I love the two fingered scrolling and right click — a couple of features that have been standard for a while on Apple’s laptops but which weren’t available on my PowerBook. Scrolling in particular is something I instantly fell in love with (once I realized it worked better with my middle finger and ring finger), and now I’m wondering how I ever got along without it. I was a little worried about the keyboard on the Macbook but it hasn’t been an issue, I probably don’t like it quite as much as the old PowerBook keyboard but I like it just fine. What I do miss is the backlighting on the PowerBook, that was a nice touch. Battery life is also a welcome improvement over the PowerBook (although the current 15″ Pros have the same battery life thanks to their LED backlights and Santa Rosa chipset — these will make the MacBook even better when Apple updates the MacBook down the road). Finally, there’s the price. I don’t think Apple has ever had a laptop that is as good a value as the little MacBook. It might not sound like it from this post, but the PowerBook was by far my favorite computer I’ve ever had in over twenty years of using computers. It was my daily companion for over three years, and I would have kept it another three if it hadn’t been for the lack of speed. The MacBook has big shoes to fill, but so far the honeymoon period hasn’t worn off like I would have expected. Back when I had my 12″ PowerBook, what I really wanted was a widescreen version, and the MacBook comes pretty close to that. The art world is abuzz over the discovery of what many are calling This Generation’s Picasso. 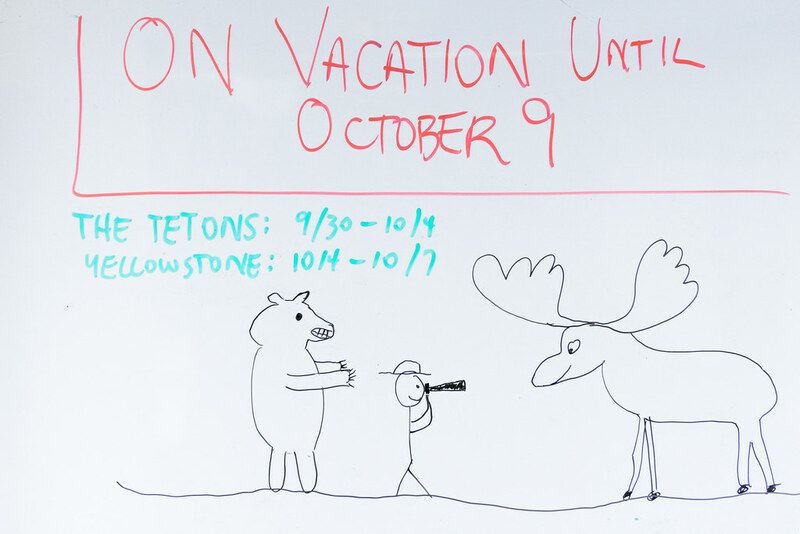 I drew this on my whiteboard at work last fall to inform my group I was leaving for Yellowstone and the Tetons.